Last Logged on 2017-06-30 11:08:34. 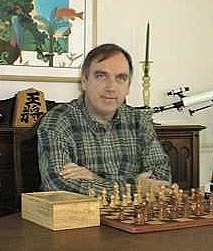 R. is a registered chessvariants.com member. Born in 1949, he is the editor in chief of Games Magazine, which he joined in 1978 after a brief career as a lawyer. A game inventor with several published games and an avid game player with considerable tournament experience in go, chess, bridge, and shogi, he is the author of New Rules for Classic Games (which includes rules for some of his own chess variants, such as Extinction Chess and Wildebeest Chess), Test Your Baseball Literacy, and The Original Trivia Treasury: 1,001 Questions for Competitive Play. He lives in Bucks County, Pennsylvania, a suburb of both Philadelphia and New York City, with his wife and two daughters (ages 10 and almost 12). His favorite sport to participate in: skiing; to watch, his daughters' gymnastics competitions and soccer games. For citational purposes, we keep records on anyone who contributes content to this site. Since R. Wayne Schmittberger has contributed content to this site, our database listing on RWSchmittberger needs to stay up. But if this person is dead or no longer interested in remaining active on this site, let us know, and this account can be made inactive.